The Netherlands' Dylan Groenewegen crosses the finish line to win stage seven. 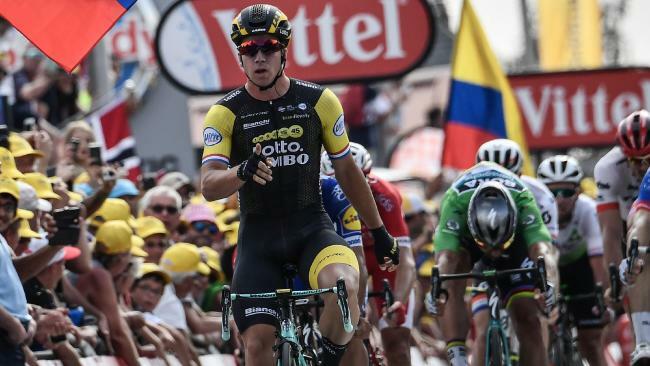 DUTCHMAN Dylan Groenewegen outblasted his rivals to the line in a sprint to take the 231km seventh stage of the Tour de France - the longest of the race. Groenewegen, who won the final stage on the Champs Elysees last year, crushed the pedals with 200m to go to easily beat Colombian Fernando Gaviria as the riders hauled themselves from Fougeres to Chartres. World champion Peter Sagan, gunning for a record-equalling sixth green jersey for the points classification, took third place. Belgian Greg van Avermaet stayed safe in the bunch all day and retained the overall leader's yellow jersey at the end of the stage, six seconds ahead of Welshman Geraint Thomas. Australia's Richie Porte remains in 11th spot - 51 seconds behind BMC teammate van Avermaet. Four-time and defending champion Chris Froome is in 14th place, one minute and five second behind the yellow jersey of van Avermaet. Groenewegen told reporters after the stage: "I hope there's more. I have the legs to win now, so we celebrate tonight and maybe the same tomorrow." All the top contenders for the overall victory enjoyed a comfortable day as the race heads towards a much-feared ninth stage featuring cobbled sectors on Sunday just before the first rest day. Halfway through the stage, the AG2R-La Mondiale, Trek and Movistar teams accelerated in crosswinds and caused splits in the peloton, with Irishman Dan Martin, one of the overall contenders, trapped behind. But the move eventually failed and the bunch was compact again with 95km left. "We knew there would be some crosswinds and other teams were interested in trying something," said AG2R-La Mondiale manager Vincent Lavenu, whose leader Romain Bardet lost half a minute following a mechanical in the finale of Thursday's sixth stage. "Unfortunately it did not work but at least we tried." The move at least ended Yoann Offredo's ordeal. The Frenchman, who had been on a solo breakaway for 100 kilometres, was swallowed by the peloton. Another Frenchman, Laurent Pichon, then tried his luck alone too, but the pace was controlled by the sprinters' teams, and the Fortuneo-Samsic rider was reined in about 40km from the finish. Saturday's eighth stage is a 181-km ride between Dreux and Amiens that should once again favour the sprinters.